In cultures around the world, we gather together over food: we have dinner dates, drinks with friends, favorite festivals, and big family meals at our grandparents’ house. What happens when we can’t eat that food any more? Some people make the mistake of giving up their social life altogether because they simply don’t know how to manage it. 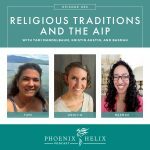 Today, I have 3 experienced AIP-ers on the podcast to share their experience and advice for having a full and fun social life while still staying true to your healing diet. It can be done! I'll be at PaleoFx over Memorial Day weekend! Come visit me at the Paleo Magazine Booth on Saturday at 10:00am for an AIP Q&A. The winners of last week's giveaway were michyjeanne and cshartle (iTunes reviewer names). They each won a copy of my book, A Simple Guide to the Paleo Autoimmune Protocol. Mitch Hankins is the blogger behind Instinctual Wellbeing. He follows the AIP to manage Hashimoto’s, celiac disease & rheumatoid arthritis. When his health was at its worst, he actually became disabled and bedridden. He couldn't work and had to move back in with his parents for 6 months. The AIP, combined with functional medicine restored his health and put him into remission for 1-1/2 years. Recently, he experienced another flare, but much milder than he has in the past, and he credits the AIP for that. He also believes in the power of the Mind-Body-Spirit Connection for autoimmune health. Gabriella Schneider is the blogger behind Beyond the Bite 4 Life. She follows the AIP to manage chronic lyme disease. She was 13 years old when she first got sick, and at her worst was bedridden and in and out of hospitals. Now at age 19, she's living independently and going to college. The AIP diet and lifestyle had a huge impact, along with the help of a homeopathic practitioner. Sleep is essential to her health, and her pilates practice has actually been a powerful mind-body practice, helping her connect with her body in a positive way. Laura Vein is the blogger behind Sweet Treats. 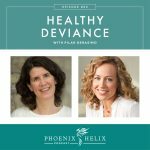 She follows the AIP to manage interstitial cystitis, fibromyalgia, and suspected celiac disease. She shared her healing story on Episode 34 at time stamp 1:01:53, so definitely give that a listen. Laura: She prefers to entertain at her apartment, rather than going out to eat. She prepares AIP meals everyone can enjoy, like Roast Chicken and Vegetables or Pulled Pork, with a side salad. She brings the white sweet potato salad from the Nourish Cookbook to potlucks, and her friends now request it. She also embraces her lunchbox and takes it with her whenever she leaves home, so she always has food if she gets hungry. She takes it with her to friend's houses, events and even restaurants. The one food she misses the most is pizza, so a pizza party would be hard for her to attend, although she might consider bringing her own pizza following her favorite recipe from The Healing Kitchen cookbook. Mitch: He loves going to live music concerts. He and his friends also like playing video games. That was true before AIP also. Now, he just brings his food with him. Like Laura, his lunchbox is his “security blanket.” He purchases seated tickets now, rather than standing room only, because he knows he'll need to rest at a long concert. He also started to get more creative with plans with friends, choosing non-food related activities: bowling, going to the park, going to a play, being a “tourist” in his own hometown and looking in the paper for cool things to do. The AIP diversified his social life. Gabriella: She takes her lunchbox everywhere too, so that's unanimous. She finds that as long as she's confident and comfortable with her diet, her friends are, too. Regarding the lunchbox, they all use insulated ones that keep food cold. They either add a small ice pack, or freeze their food the night before and let it defrost during the day – ready to eat later. Laura loves chicken liver pate for lunch and it freezes and defrosts well. All of them pack lunches from whatever food they currently have in the fridge. For Mitch, lunch is part of his weekly meal planning. Gabriella: For a wedding she attended, she spoke with the caterer in advance to see if they could prepare an AIP-friendly meal for her, and they were happy to do so. Another option is to bring your own food and hand it to the caterer when you arrive. Explain that you're on a medical diet and ask that they heat and plate your meal, and serve it to you when the other guests are served their dinner. Laura: She has also found caterers to be very accommodating. She has worked with wedding caterers long-distance, explaining her dietary restrictions via email. However, she doesn't expect caterers to accommodate dessert, so she'll bring her own to special events where dessert is being served. AIP crumbles in small mason jars travel well. She has also attended an annual BBQ competition, and she brought her own BBQ pork and sweet potato salad. KC Natural also sells AIP-friendly BBQ sauce. Laura also tried going off-diet on vacation once, and the resulting pain she experienced removed all temptation to do that again. Mitch: He calls festival venues in advance to explain that he's on a medical diet and gets permission to bring a cooler to events. Communication is key, and Mitch really recommends that we overcome any fear, awkwardness or embarrassment we feel about our food restrictions, and simply ask for what we need. Be kind and respectful in your conversation, and people are often very happy to help. Asking does get easier with practice. Mitch: Alcohol was a big part of his life before AIP – both work parties and hitting the bars with his friends. After AIP, he switched to mocktails, kombucha, La Croix, or herbal iced teas, so that he could enjoy a special beverage without compromising his health. However, he no longer is interested in attending events where the whole purpose is to drink, so he just declines those invitations. Gabriella: Although she is young, she has friends who drink. She's not tempted herself, because her health is too important to her, and her friends don't pressure her. Laura: Since alcohol exacerbates interstitial cystitis, Laura had given it up prior to going AIP. Like Mitch, she likes to have a delicious alcohol-free beverage to enjoy. And since she's been on the AIP a long time, she has been able to reintroduce a small glass on wine occasionally. 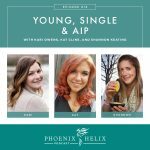 We covered this on a prior podcast: Episode 16: Young, Single and AIP. Even if you're not young but you are single, the dating advice will resonate. Laura: She brings her own food to these gatherings, along with an AIP-friendly dish to share. Mitch: Recently traveled for his Grandma's 80th birthday party, which was a huge gathering of his extended family. He spoke with one of his aunts who would be helping with the cooking to see if they could accommodate him. If not, he was happy to stop at a grocery store to pick up some food before arrival. Gabriella: She and her parents host a lot of family gatherings, putting them in charge of the food. Otherwise, she does the same as Laura and brings her own food along to eat. Eileen: Goes to a week-long family reunion every 2 years where everyone else eats a Standard American Diet. She brings Paleo on the Go frozen meals, which makes it very easy to stay on the protocol while sharing the table with those she loves. She also brings along more AIP-friendly desserts than she would eat at home, so she's not tempted by all the junk food. Eileen's mother expresses love through food, in particular baking. So, after going AIP, Eileen brought some special ingredients on her next visit with her mother, and they baked together, keeping the tradition without hurting her health. For more advice, listen to Episode 6: Paleo Holiday Survival Guide. Resource articles: How Do I Get the Support of Family and Friends and Meeting Online Paleo Friends in Real Life. 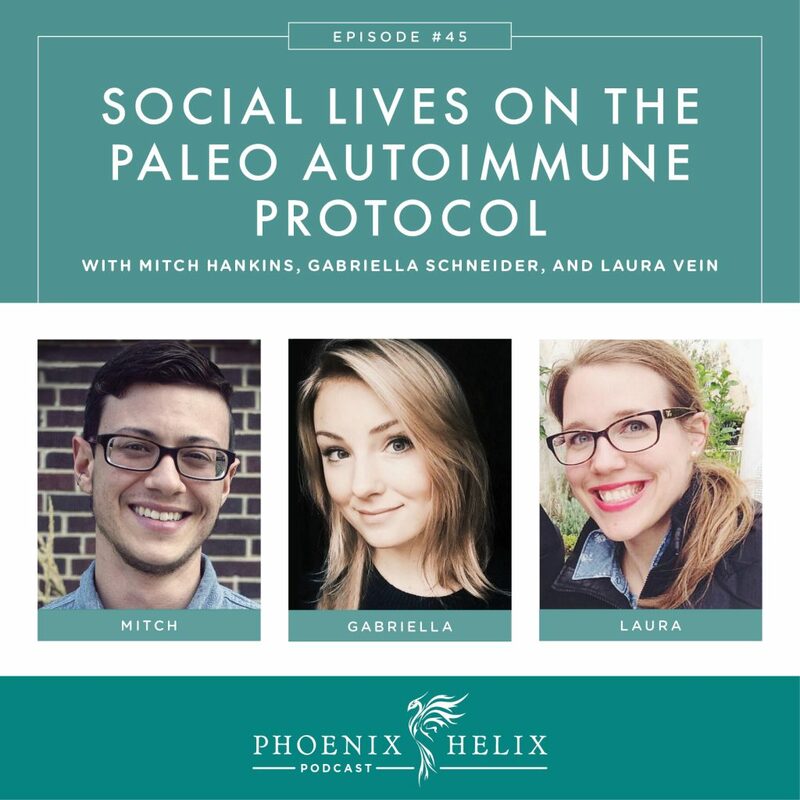 Gabriella: Being on a healing diet doesn't take away from who you are, and you have every right to go out and have fun and maintain your friendships. Laura: Social interaction is something we all need, and while it takes planning on the AIP, it's worth it. Don't allow yourself to become isolated, because that can negatively impact your health, too. And communication is key. Don't be afraid to ask for what you need, and set boundaries where necessary to take care of yourself. The AIP might feel overwhelming at first, but it gets easier. Mitch: Try to release some of the fear that can build up around social events, and instead focus on enjoying yourself. Don't bring stress with you when you go out. Emotions affect digestion, and we tolerate foods better when relaxed and happy. If you have trouble moving through fear, try EFT. And get a lunchbox. Mitch blogs at Instinctual Wellbeing and his favorite social media is Instagram. Gabriella blogs at Beyond the Bite 4 Life and her favorite social media is also Instagram. Gabriella also has an ebook which I love, called Organ Meat Makeover. Laura blogs at Sweet Treats and her favorite social media is also Instagram. She also has an ebook, called Holiday Sweet Treats.